With this addition to his popular La Bomba line, Erik Espinosa went small in size and big in impact. While all La Bomba cigars hit hard, this petit corona connects with a wallop. Like its siblings, the Sake Bomb is a Nicaraguan puro, including a Habano wrapper. The Sake Bomb blend is said to have been tweaked to increase the strength. It sports the line’s trademark long fuse and a bright yellow foot band. For those who like a high-powered smoke and find yourself suffering these days through the cold to enjoy a cigar, the Sake Bomb is certainly a cigar to consider. The length is only 4.5 inches and the ring gauge is 42. The MSRP is $6.75, though they’re often priced considerably lower online by the box of 10.
Pepper and spice make an aggressive appearance—make that an extremely aggressive appearance—at the start. And they tend to linger on the finish as well. After an inch or so, the pepper becomes a little less persistent, and I found flavors of nutmeg and dark, strong coffee mixed in. In the final third, the strength seems to ramp up as a tobacco sweetness comes to the fore. Both the draw and combustion on those I’ve smoked have been excellent. It also burns slowly and produces a lot of smoke. 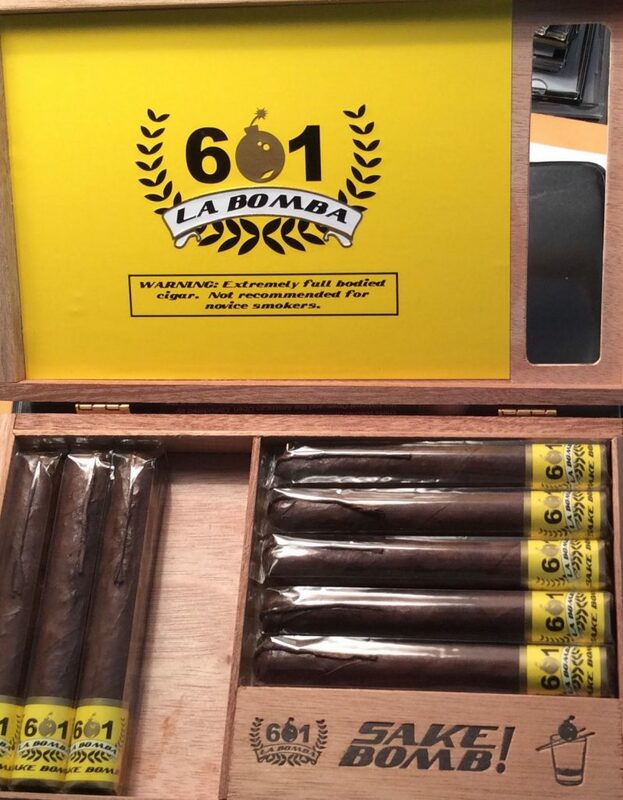 I’ve had quite a few, though by no means all, of the ever-expanding La Bomba line. And I enjoyed each of them. However, this little explosive device may be my favorite. It definitely knocks you around but not for so long that you’re exhausted by the experience. I raise my glass to the Sake Bomb and give it a rating of four stogies out of five.